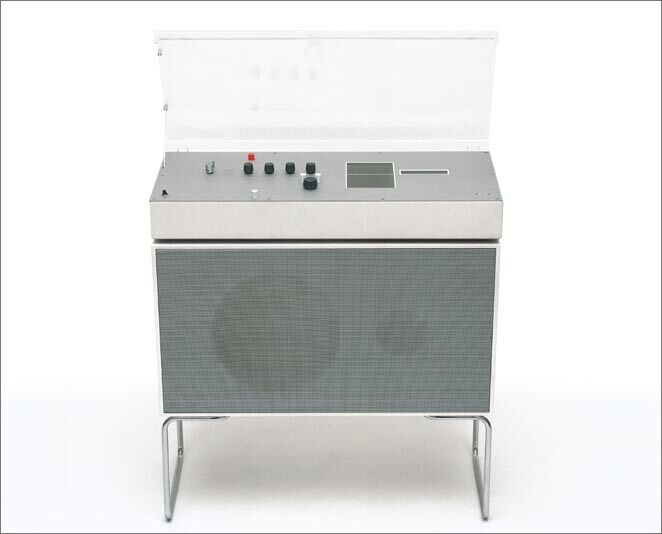 "Designed in 1962 by Dieter Rams, the "Audio 1 Kompaktanlage" is a milestone of german post-war design. It embodies, even more than its predecessor, the famous "snow-white's coffin," the design ideals of the rationalist "Ulm School." These sober paradigms of utility and matter-of-factness are playfully remodelled in the "ReBraun": Two TFT-Displays take the place of the radio scales, the lettering on the anodised front plate ironically quotes the lingo of the radio era. A randomly positioned button, labelled "Zufall" (Randomness) stands for the freedom from mechanical constraints. The antenna does not receive any FM radio, but is used to connect the system to the internet via Wireless LAN. The case and acrylic hood were lowered by several centimetres for sporty reasons (think: hot rod! ), and the window that formerly contained a signal strength readout now becomes a tabernacle for the old Braun nameplate."